“Good Girls Go To Heaven. 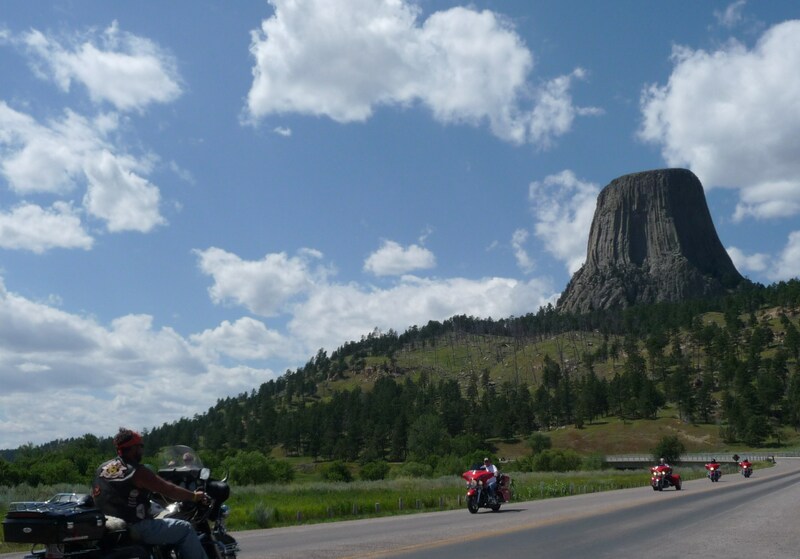 Bad Girls Go To Sturgis” – Motorcycles, Devil’s Tower, and Buffalo | "Where in the world are Barry and Renee?" 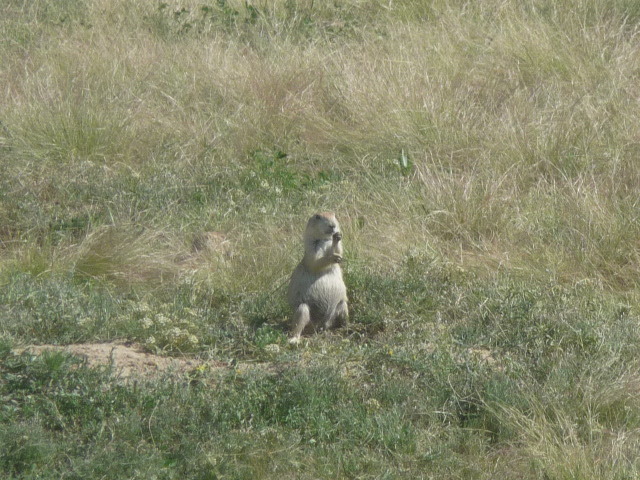 One of the fantastic things about being on the road involves the surprises. 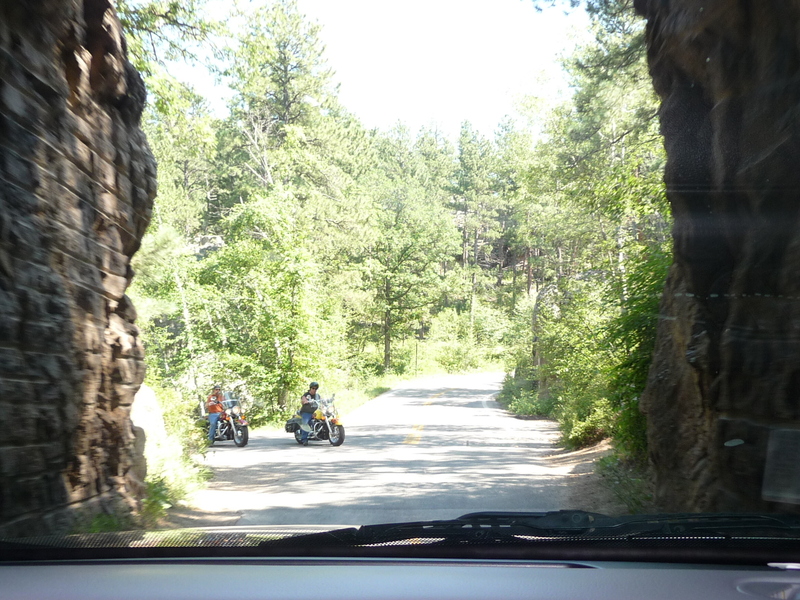 As we headed toward our next Servas host, we couldn’t help but notice motorcycles, of all types, on the road with us. 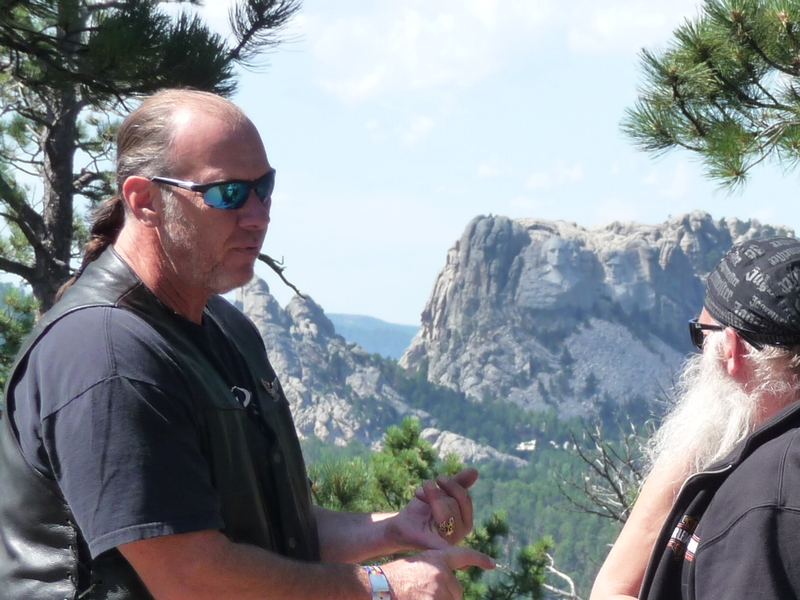 We found that our Servas host lives near Sturgis, South Dakota, the site of the annual Harley-Davidson Motorcycle Rally. This year was number 71. 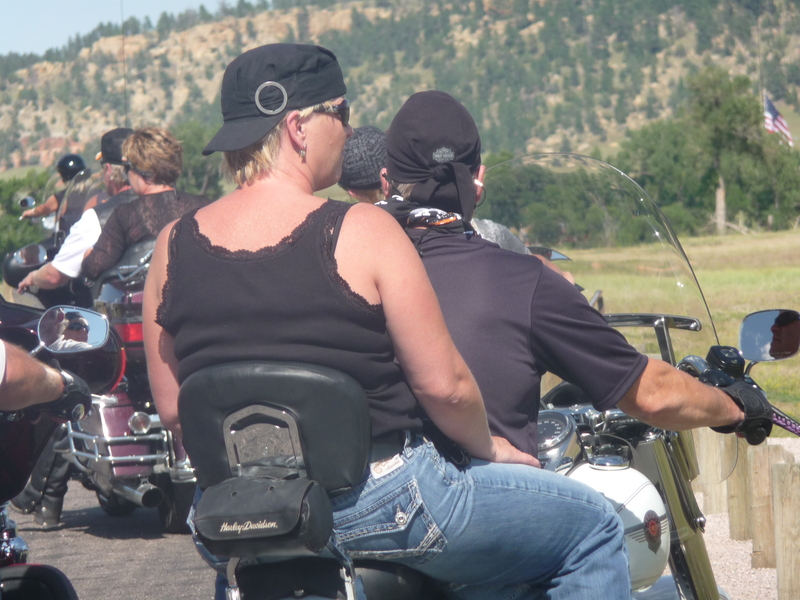 These were not the Hell’s Angels of long ago. 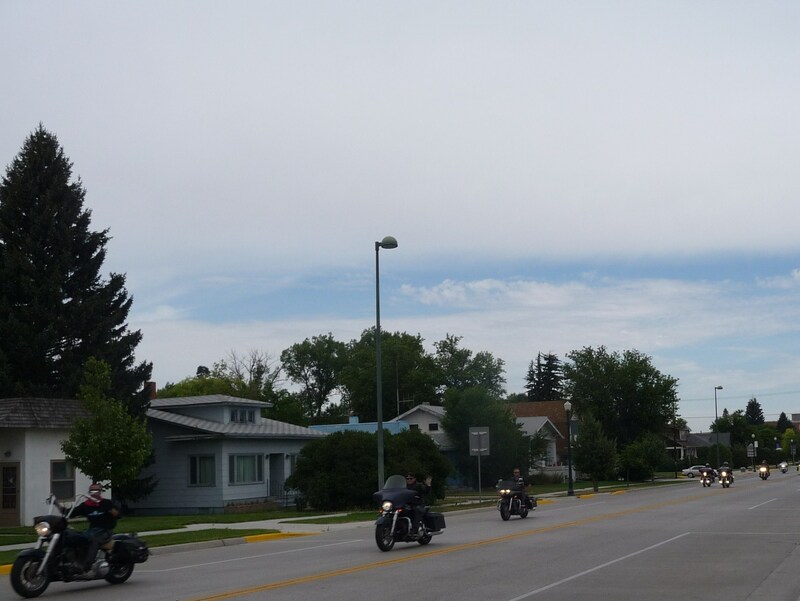 On the road, the riders acted in considerate and safe ways. These bikes were not for the down and out. In fact, many of the owners must be quite affluent. One biker told me that her motorcycle jacket is heated. 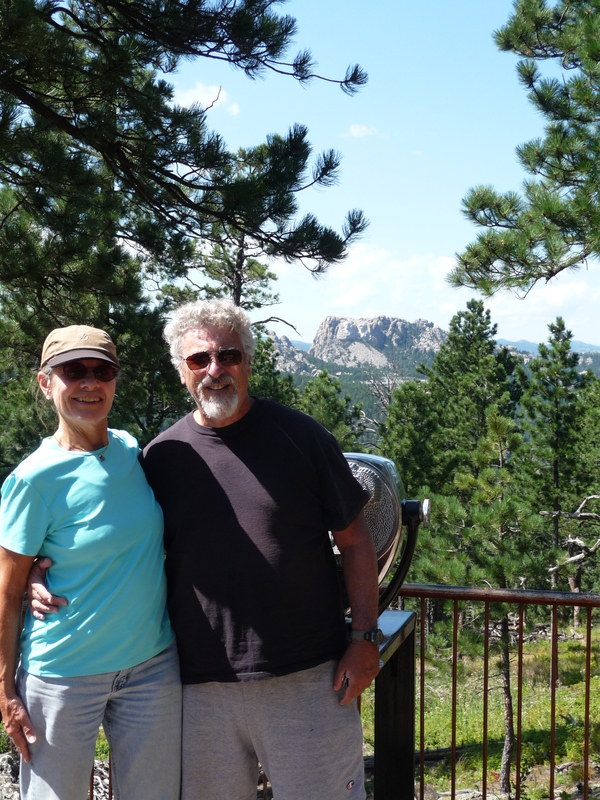 She and her husband talk via microphones–no more yelling into the wind! 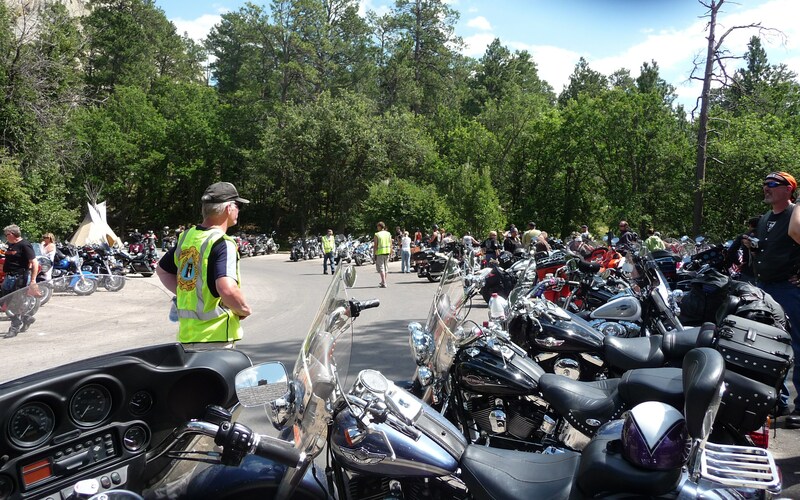 As part of the rally, the bikers had great music concerts at night, and we saw bars with many parked bikes. Stopped for liquid refreshment or shopping? Somehow my stereotypes of bikers weren’t working. 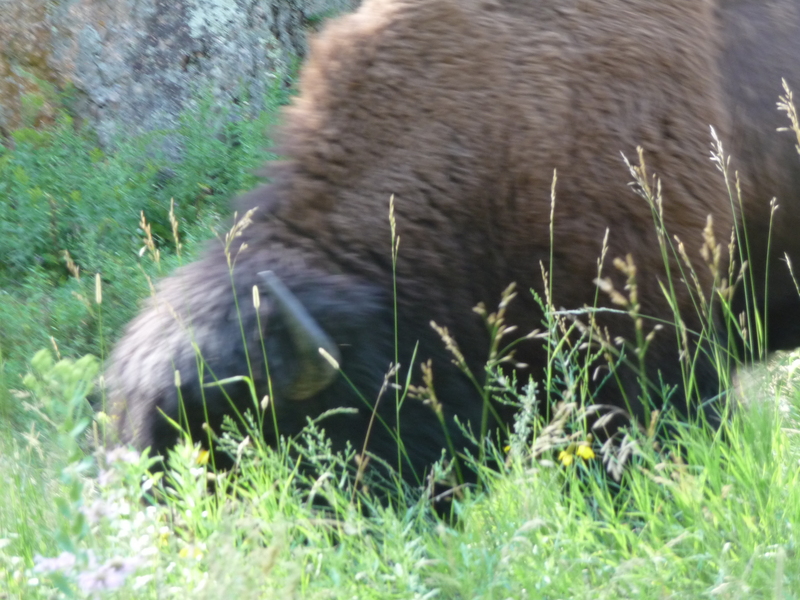 During the day, many took rides, as we did in our rental car, to enjoy the South Dakota and Wyoming open lands and sights. Can you see the little red dot near the upper right? 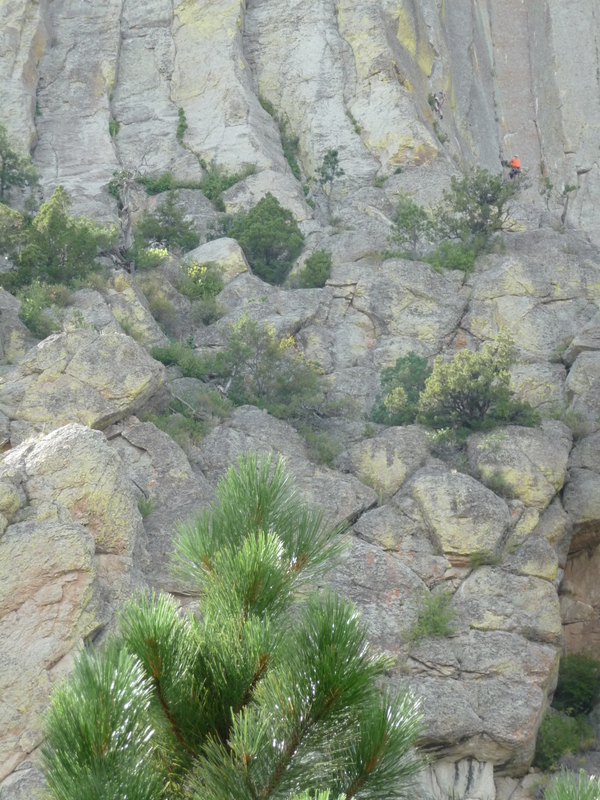 That’s a rock climber on Devil’s Tower. 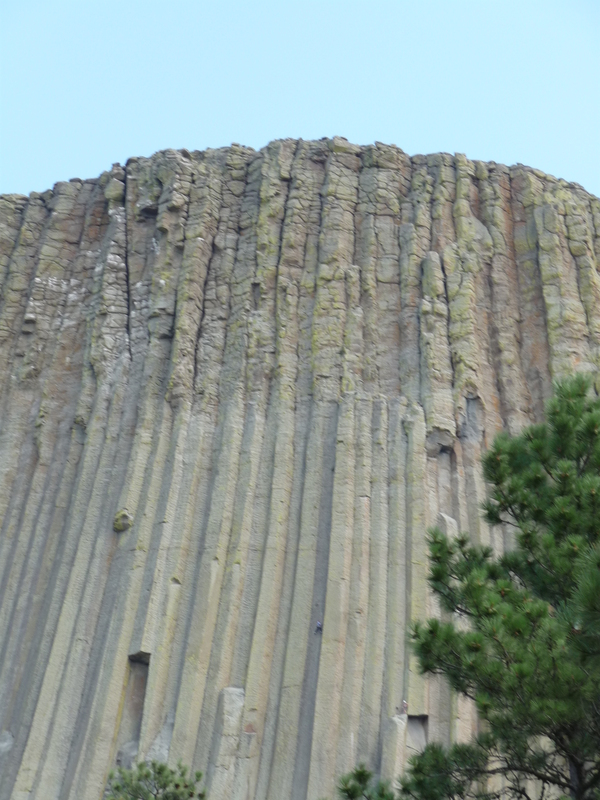 For more information about Devil’s Tower–and the current climbing opportunities, go to <http://www.nps.gov/deto/index.htm>. 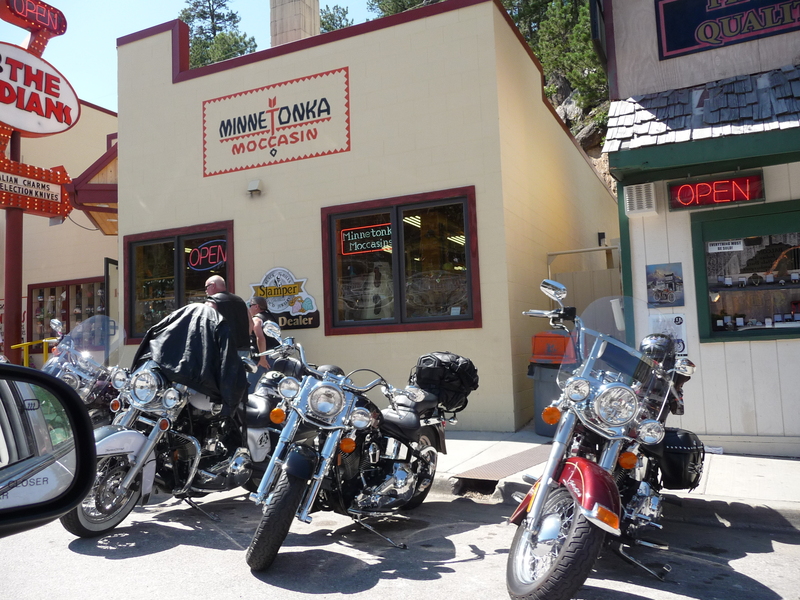 Some of the bikers – and we – also went to nearby Mt. Rushmore. Mt. 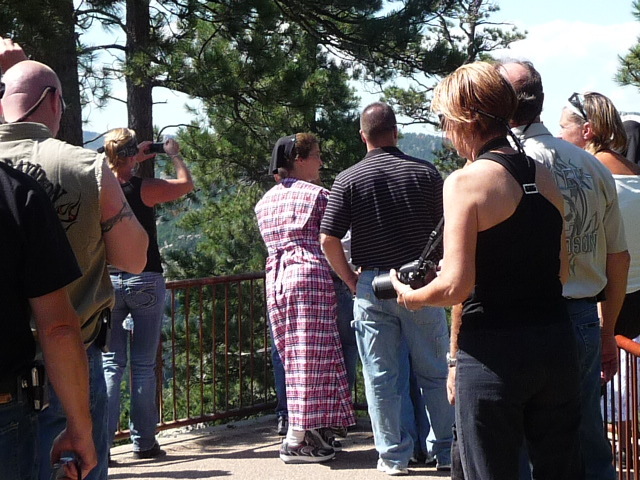 Rushmore–Although this view looks tranquil, people swarmed everywhere. We drove on. For more information on Mt. 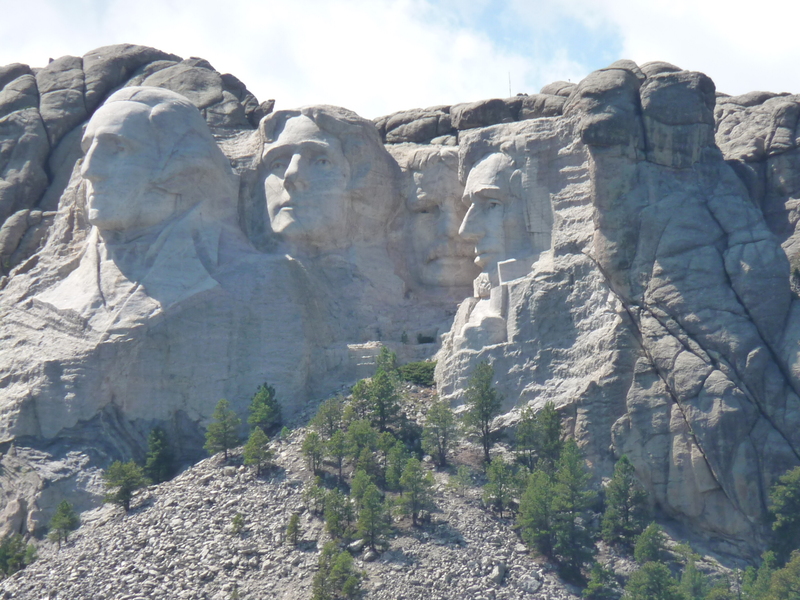 Rushmore, go to <http://www.nps.gov/moru/index.htm>. Do you recognize these men? I overheard the one on the left say he had paid his drummer $18,000 for one concert. Get your kids to practice their drums! 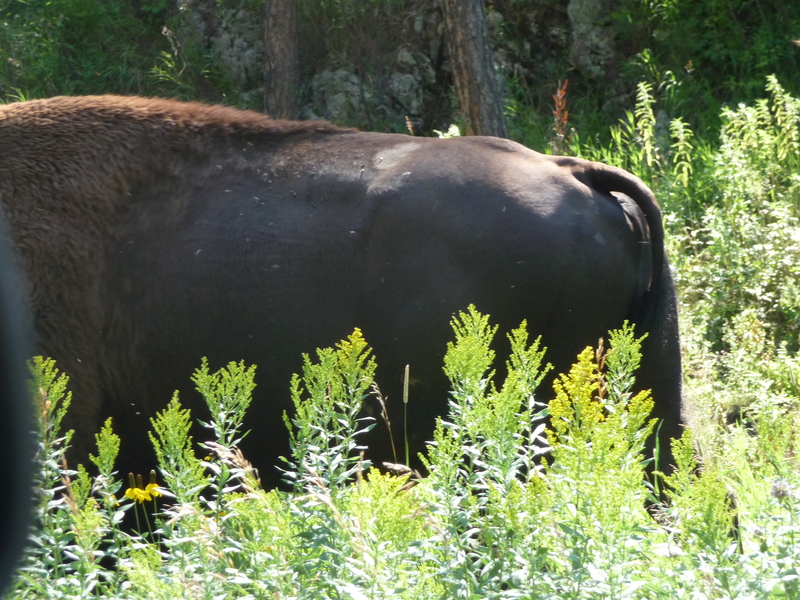 We were so close, I couldn’t get the whole buffalo in one shot–so here is his rear. 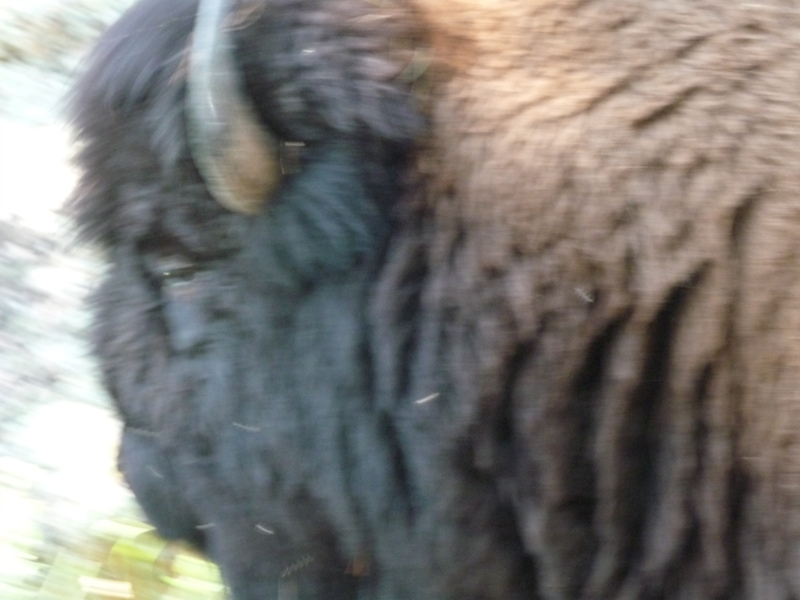 He’s looking–and I’m staying in the car. As always, we met interesting people too. During her first day of summer work at a local motel when she was 14, one young woman set her heart on owning a motel. 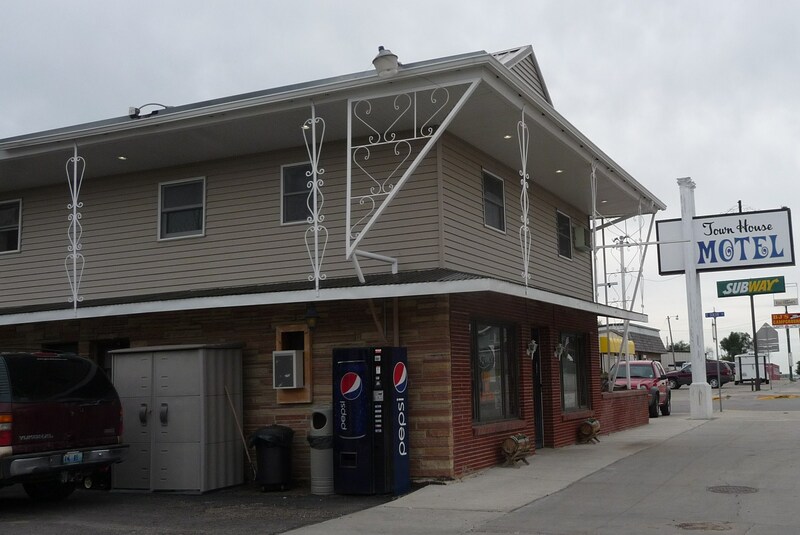 When the owner’s son of the best motel in town didn’t ask her to marry him, she bought her own motel! Now at 24, she is running her motel and majoring in business at college. Do you have plans for your summer vacation this year? 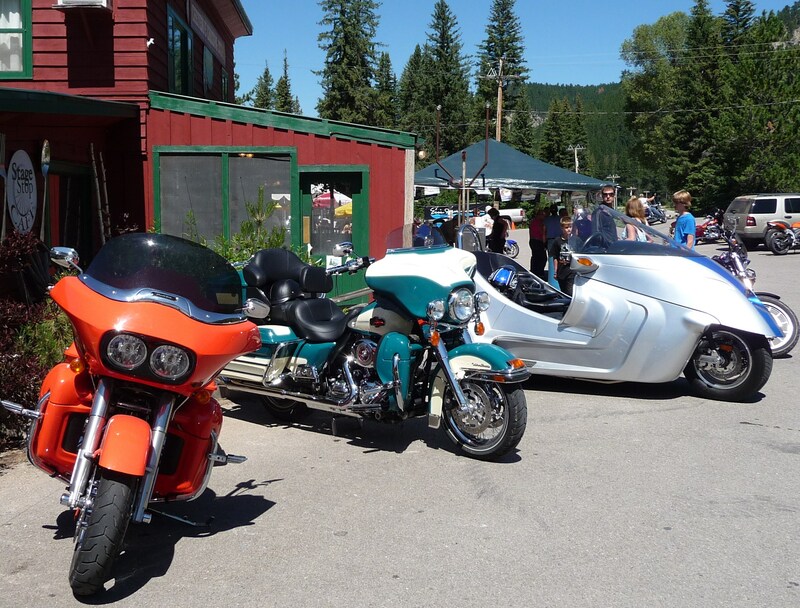 Consider going to the 72nd Anniversary Sturgis Motorcycle Rally held this year from August 6-12, 2012: <http://www.sturgismotorcyclerally.com/>. Everyone seemed to have a great time. You would too. Hi thanks, a bit belated, for the lovely calendar. A bit of cheer for the wisconsin winter. Where are you guys? We really enjoyed your visit here. Also I want to thank you because I think you inspired (no pun intended, I can’t be that clever even if i want to) Jeff to get an evaluation for sleep apnea which it turns out he has big time. he is still getting some of the kinks worked out with the machine, but the other day he said he finally knew what it was like to get a good nights sleep. no other big news here except that we now live in the middle of frac sand heaven and are working hard not to let it destroy our land, county etc. urgh…….